Stella Arnaldo's Blogspot: Where in the world is Cito Lorenzo? THE testimony of former Agriculture U/Sec. Joke-Joke Bolante yesterday was certainly a joke on the Senators and the Filipino people as he stood his ground and denied there was any anomaly involved in the release of some P728 million to congressmen and local government units in fertilizers and other farm inputs under the Dept. of Agriculture's Ginintuang Masaganang Ani program. Bolante tried to pin the blame on his former boss Luis "Cito" Lorenzo, then agriculture secretary, whom Bolante said ordered the release of the funds. Which has given rise to questions anew, "Where in the world is Cito Lorenzo?" MANILA, July 12, 2004 (STAR) By Jess Diaz - Politics is behind last week’s resignation of Agriculture Secretary Luis "Cito" Lorenzo, opposition Sen. Aquilino Pimentel Jr. said yesterday. "It’s politics. It’s the culprit behind the forced resignations of Cito Lorenzo, Joey Lina (former secretary of the interior and local government) and (Social Welfare Secretary) Dinky Soliman," he said. Pimentel said President Arroyo forced the agriculture secretary to quit because she lost in the areas in Mindanao where the Lorenzo family runs agricultural plantations and agriculture-based businesses. After that stint, w/c I believe was just for a year, and telling journalist-friends about how he was able to achieve his mandate of creating one million jobs, Lorenzo then kept to a low profile. Perhaps he could no longer take the heat from the brewing controversy that came to be known as the fertilizer fund scam. 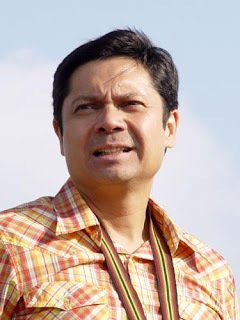 Last we heard, Lorenzo then involved himself in Gawad Kalinga and became its adviser, such that in March 2007, he even gave an inspirational talk in St. Louis, Missouri during the premiere of the Cesar Montano-starrer "Paraiso", a film supposedly on the poor in the Philippines and GK's projects. So if the Senate wants to get in touch w/ Lorenzo, then all it has to do is call up Tony Meloto. Why Lorenzo was never summoned by the Senate during its first investigation into the fertilizer fund scam, I wouldn't know. If he was summoned, he never showed. So the questions still linger, did he have a part in pushing for the release of funds w/c have been cited as the source of the presidentita's campaign kitty, she who was then running against the very popular veteran artista Fernando Poe Jr.? But it is a well-known fact among the business and political communities that Bolante was a "bata ni Mike", referring to the First Gentleman, and Bolante's fellow Rotarian. This meant that even if Lorenzo tried, he wouldn't have been able to shove Bolante out the door. I haven't heard anything negative about him either from the business community even from the older CEOs who only have kind words for their younger colleague. Would Lorenzo tarnish his and his family's reputation by pushing a program w/c he knows would just be used as an election scheme for his boss in Malacañang, in exchange for what? a 20-percent commission? Ang cheap naman. Although it's true, there are some people who would it for less. It's time for Lorenzo, wherever he is, to come home and speak up. If he is really a "man of honor" as his friends and defenders say that he is, then it's time for him to tell the Filipino nation the truth.